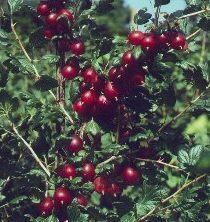 Introduced into the United Kingdom from Germany in 1996, Rokula is an excellent early, dark red dessert gooseberry. It has a wonderful flavour and is resistant to mildew. A fairly vigourous growing gooseberry variety. 1/4 standard means that the stem has been trimming during the growing process to give a partially clear stem later on.